The nation's favourite chocolate bar is having a makeover in response to the obesity crisis. A reduced sugar version of the Cadbury Dairy Milk bar will go on sale next year. 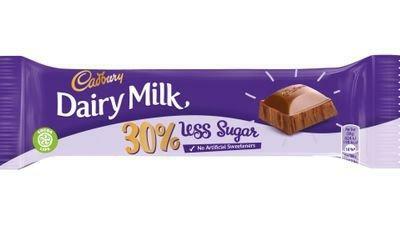 It will have 30% less sugar than the current bar and Cadbury owner Mondelez International (Frankfurt: A1J4U0 - news) has described it as the "most significant innovation in the brand's history". The full sugar version of the bar will also still be available. The company is also planning reduced sugar versions of some of its other confectionery brands such as Oreo and Maynards Bassetts Wine Gums and Jelly Babies products. A survey by Vouchercodes.com earlier this year suggested that on average each person in the UK ate 22 Dairy Milk bars a year. In the new bar the sugar content will be 39g per 100g, down from 56g per 100g in the traditional one, however the calorie content will be similar. Glenn Caton, Mondelez International president for Northern Europe, said the science behind the reformulation was a "trade secret" but the taste of the new bar as "incredibly similar" to the original. He said: "It tastes very, very close to the original but a little less sweet. It's been tested extensively on consumers and they love it." He added: "Taking sugar out of our products isn't easy and will take time. "Ultimately they are treats and people expect them to taste great, but we're working hard to find innovative solutions that provide more choice without compromising on their world-renowned taste and quality." The decision to reduce the sugar in Dairy Milk is part of a trend as food producers come under pressure to come up with healthier recipes. Earlier this week Kellogg (Hamburg: 944624.HM - news) 's announced it had cut the amount of sugar in COCO Pops by 40%. In May research by the UK Heart Forum and Institute of Technology, Sligo predicted that the number of morbidly obese people in England, Scotland and Wales is set to double over the next 20 years. The study found that if current trends continue, nearly five million Brits will have a Body Mass Index (BMI) above 40, up from 1.9 million in 2015. Last month the government revealed a series of new proposals to tackle childhood obesity including tougher restrictions on supermarkets displaying unhealthy foods at checkouts, banning sales of energy drinks to children and a 9pm watershed for advertising unhealthy food on television.